At the Immigrant’s Table kindly shared this recipe. A soak in a simple Asian marinade transforms tofu from a strange sponge to a delicious, juicy source of protein. 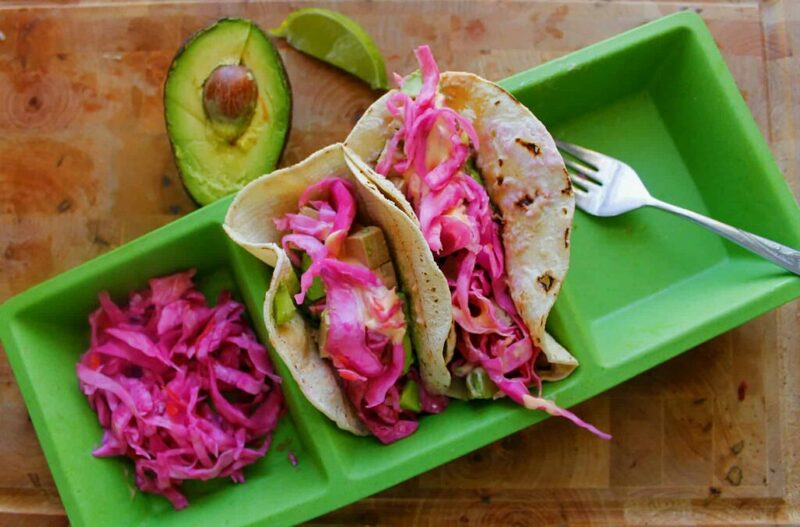 Tucked inside corn taco shells and topped with avocado and zesty cabbage, it becomes a delicious, quick lunch. Squeeze tofu slightly between your hands to extract fluids, and then chop into small cubes, each slightly smaller than 1-square inch. In a square or rectangular bowl, mix marinade from soy, rice vinegar, hot sauce and water. Soak tofu cubes in marinade, covered with plastic wrap or lid, overnight (or at least a few hours; it can also stay in the marinade for a few days, soaking up flavour as it goes along, so don’t hesitate to plan several meals from this tofu). Give the tofu pieces a stir every few hours, to ensure all are evenly coated with sauce. When tofu has soaked thoroughly and you’re ready to eat, heat up your shells (or slices of sourdough bread) on a medium-hot pan without any oil. When shells are ready, remove from heat and wrap tightly in a towel. If homemade sauerkraut is unavailable, mix ½ a cup of thinly sliced cabbage with a tablespoon of vinegar. Pit and roughly chop avocado. Drizzle with the juice of ⅛ of a lemon and a small pinch of salt. Mix mayonnaise with a squirt of hot sauce in a small bowl. Assemble your tacos (or sandwich): start with a layer of avocado, then a layer of tofu cubes, followed by homemade sauerkraut (or sliced cabbage), and a few drops (or a smear) of spicy mayonnaise. Tuck in, but ensure you have a plate nearby to catch all the delicious juices!